Sedalia, Mo. (April 27, 1972) – When an overly ambitious stock car racing buff gets carried away there’s no end or limit to what they may do. For a case in point, take a look at Bill Austin, at 29-years-old, living comfortably as a production supervisor for Western Electric in Lee’s Summit, Mo. Austin’s background went from merely enjoying racing to working in the pits to racing on occasion to part ownership of a race team. Now Austin is tackling what might be the biggest gamble in racing or any other sport – He has become a promoter. 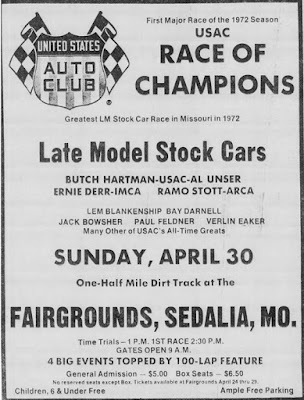 In his first promotional venture – he is on the hook for approximately $21,000 for a United States Auto Club stock car race at the Missouri State Fairgrounds in Sedalia on Sunday afternoon, April 30. The major outlay of the $21,000 consists of a $11,000 deposit to USAC, the sanctioning body. 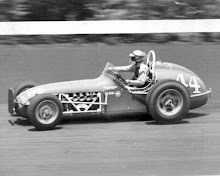 The remainder consist mainly of leasing the track at the state fairgrounds for a day, advertising and the assorted expenses of running some kind of office for the duration of the operation. Austin said he began thinking about promoting races two or three years ago and just waited to pick his spot. He said he was fully aware that J.C. Agajanian, the famed car owner and race promoter from Gardena, Calif., had hosted three races in Sedalia in 1969 and 1970. 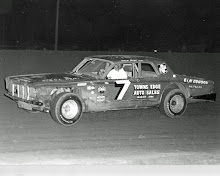 It’s a known fact that Agajanian met with little if any financial success in his two stock car races and one dirt champ race. Austin stated he has ideas beyond this single venture. First, he said, there is the possibility of having two or possibly three major races a season in Sedalia. Secondly, he thinks that importation of major drivers who would attract top crowds could lead to a super speedway in Missouri. 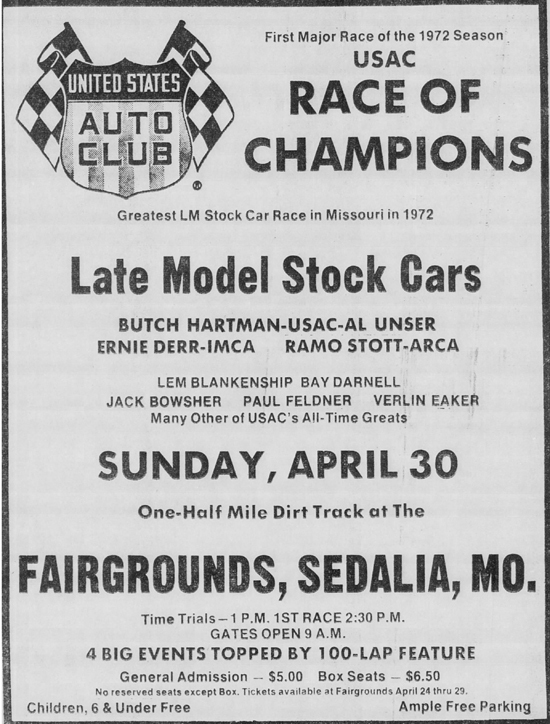 Thirdly, he thinks it’s possible that a major sanctioning organization could be formed because USAC operates primarily east of the Mississippi River and IMCA devotes most of their efforts to July and August fair dates. Austin said he selected Sedalia because fair dates attract crowds. Austin was speaking if Ernie Derr and Ramo Stott, both of Keokuk, Iowa. 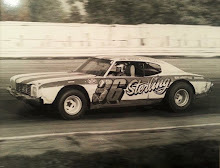 During his brief venture into IMCA competition, he became both fan and friends with the two drivers. 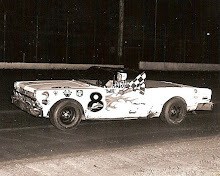 From a driving standpoint, Austin’s best year came in 1965, when his car, owned by Don Hensley of Holden, Mo., finished ninth in IMCA points. 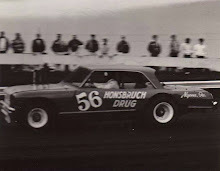 In 1968, Austin was a member of Lenny Funk’s pit crew. Several late-season victories would carry Funk to a third-place finish in the IMCA point standings. Austin stated nothing has happened thus far in the promoting aspect he didn’t anticipate. “I’d kind of like to make this race an annual event,” Austin remarked.